Sherwood Equestrian: What is an English Saddle and why do they enjoy world-wide popularity? 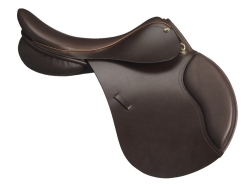 What is an English Saddle and why do they enjoy world-wide popularity? 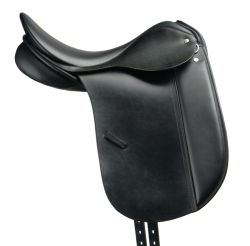 The design of an English saddle has no horn nor other elements that protrude above the main tree of the saddle. Historically based on the English hunting saddle that developed to allow the rider more movement and flexibility due to its low pommel, the English saddle is now the standard for all of the Olympic equestrian disciplines. The English saddle, designed to allow the horse freedom of movement, provided the basic design for show jumping, dressage and eventing saddles. A show jumping saddle features a forward flap that allows for shorter length stirrups for controlled jumps. For dressage, the pommel is slightly higher and the stirrups are longer. The seat is deeper and usually wider for a more comfortable position. The English showing saddle is a direct descendant of the English hunting saddle. English saddles are also used for polo. They are no longer manufactured only in England and many of the cheaper varieties are made in India. However, England-based English saddlery companies are held in high regard. Photographs courtesy of www.MoritzSaddlery.com, exporters of English Saddlery.